One of the we’ve found yet is Banc De Binary. Instead of just telling you that, we want to prove it by giving you a tour of the features. If you drop by Banc De Binary’s page you’ll immediately notice their professional attention to detail in their site design, the many awards the broker has won, such as the best binary options online platform, top rated customer service and over 5 years of service to the binary options online industry. First, you’ll open an account. You’ll notice on this page that US traders are accepted, and that you need to be 21 or older in order to trade. Registration is completely free and only takes a couple of minutes. You may select USD or EUR as your trading currency. On the next page you’ll have the option of selecting your credit card, bank wire transfer or Moneybookers as a deposit method. Once you select your payment method, you’ll be able to enter the amount of your deposit. Note that the minimum deposit amount to get started is 250 EUR or USD. If you deposit less than this, you’ll be unable to place a trade. You’ll be offered sign-up match bonuses when you deposit funds. Bonuses can be great, but remember that they are basically a form of trading on leverage; you can’t withdraw the amount of the bonus until you’ve turned over the amount a number of times. If you aren’t comfortable with leverage, you can reject the bonus, or simply trade small enough amounts in the beginning that you aren’t actually touching the bonus—simply waiting to collect it later. Other bonuses which Banc De Binary offers include rebate bonuses for VIP clients, consistent deposit bonuses and referral bonuses. If you want a demo account (which we highly recommend), you’ll need to deposit your initial 500 USD or EUR. At that point you can contact customer service and ask that your account status be changed to demo, at which point you can trade 50,000 virtual USD or EUR. You’ll also receive expert advice from brokers who are available 24/7 to teach you and how to use trading techniques to become profitable. This is not one but two great services which most binary options online brokers don’t offer. If you’re serious about trading and you want to become consistently profitable, demo testing is a must. It’s not only how you get used to trading live, but also how you learn whether your trading method fits into your real life, and if not, how you can adjust it until it’s profitable. All without spending a dime. You’re free to withdraw your initial deposit at any point as long as you did not accept any bonus offer. 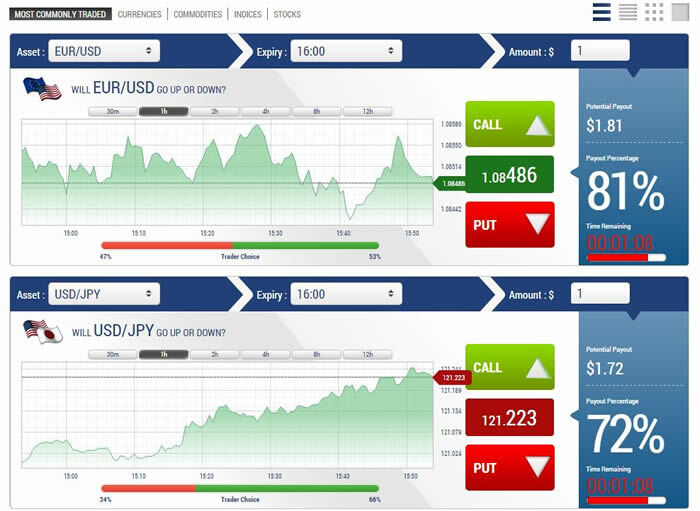 Across the top of the trading area you’ll see Binary Options, Option Builder, One Touch, 60 Seconds, and Binary Meta. 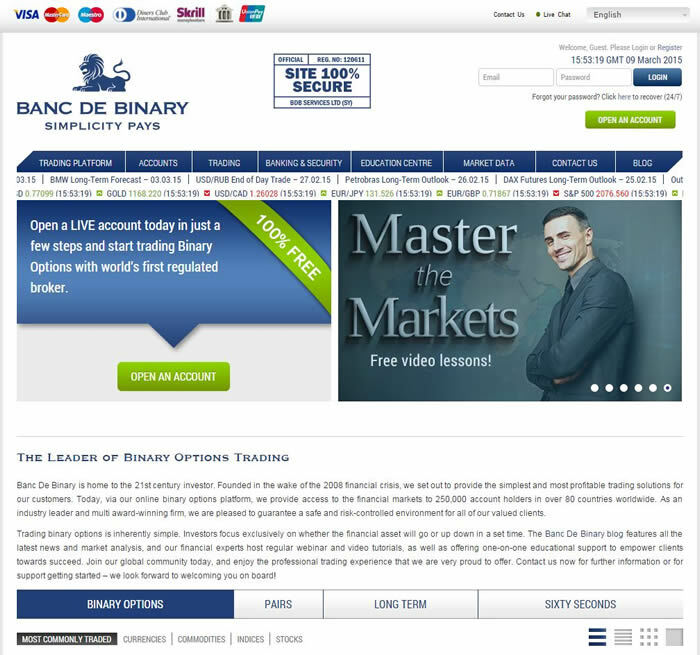 These are all different types of binary options online trades you can make at Banc De Binary. The first one selected is Binary Options, which means High/Low, or Call/Put. On the screenshot above, you’ll notice an example of a Call/Put Trade for USD/JPY. You can receive a 72 percent payout if USD/JPY expires in the money once you choose Call of Put. If you think the currency pair will be trading above its current value when the option expires, you choose “Up.” If you think the currency pair will be trading below its current value when the option expires, you choose “Down.” If you’re right, you win a 72 percent payout. If you’re wrong, you lose your investment. Option Builder is a cool type of Call/Put option where you can not only choose the asset, but also the expiry period. The return on a winning or losing investment will depend on the investment amount and the expiry period you choose. This gives you more control over your trade since it allows you to choose the time period. It’s a great capability! These trades are special trades with one minute expiry times. Trading the 60-second timeframe is not for the inexperienced trader, unless of course you’re just doing this to have fun. If you want to make money though, you should start out with slower trades. 60-second trades are an easy way to lose money fast if you don’t know what you’re doing. Some traders excel at these trades after they’ve practiced and learned, however, so it’s a great type of trade to include. BinaryMETA isn’t actually a trade type, it’s an enhanced trading platform where you can place a Call/Put trade, view more time frames, and get a better feel for what’s going on. If you’re really serious about trading, however, you should be planning yore trades using high quality charting software like which allows you to plot technical indicators. Once you’ve planned a trade, you can go to the OptionBuilder and put in an amount and an expiry time. Trade anything from 1 USD to 8000 USD. This is a broad range. Expiry times vary from 60 seconds to one month. Another broad range! Yes, we’re very pleased with them. We love that they offer a broad range of expiry times and trade amounts, which gives you more control over money management and your trading method. The company seems to offer great customer service options and accepts traders from the US and around the world. What really impresses us about Banc De Binary however is their attitude toward trading, which is very level and forthright. They offer a fully functional demo account without asking you to risk money (even though you need to make an initial deposit), and they provide a lot of educational resources on the site. We also discovered extensive resources here: http://www.bancdebinary.com/ . Whether that site is directly run by Banc De Binary or an affiliate, we’re not sure, but the articles are great and cover a wide range of topics. Banc De Binary seems set on encouraging responsible trading from its customers, and that’s the mark of an honest, trustworthy broker. They’re well worth looking into! They also offer hands down some of the best support for worldwide traders.